The proper prayers for the Thirteenth Sunday after Pentecost can be found below. A PDF version is available here: Thirteenth Sunday after Pentecost. ALMIGHTY everlasting God, give to us increase of Faith, Hope and Charity: and that we may deserve to obtain what Thou dost promise, make us love what Thou dost command. Through our Lord Jesus Christ, Thy Son, Who liveth and reigneth with Thee in the unity of the Holy Ghost, God, world without end. EPISTLE From the Letter of Blessed Paul the Apostle to the Galatians, 3. 16-22. BRETHREN: To Abraham were the promises made, and to his seed. He saith not: and to his seeds, as of many; but as of one: And to thy seed, which is Christ. Now this I say, that the testament which was confirmed by God, the law which was made after four hundred and thirty years, doth not disannul, to make the promise of no effect. For if the inheritance be of the law, it is no more of promise. But God gave it to Abraham by promise. Why then was the law? It was set because of transgressions until the seed should come, to whom He made the promise, being ordained by angels in the hand of a mediator. Now a mediator is not of one, but God is one. Was the law then against the promises of God? God forbid. For if there had been a law given, which could give life, verily justice should have been by the law. But the Scripture hath concluded all under sin, that the promise by the faith of Jesus Christ might be given to them that believe. HAVE regard, O Lord, to Thy covenant, and forsake not to the end the souls of Thy poor. Arise, O Lord, and judge Thy cause: remember the reproach of Thy servants. Alleluia, alleluia. (Ps. 89. 1.) Lord, Thou hast been our refuge, from generation to generation. Alleluia. GOSPEL Continuation of the holy Gospel according to St. Luke, 17. 11-19. 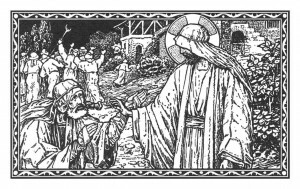 AT THAT TIME, as Jesus was going to Jerusalem, He passed through the midst of Samaria and Galilee: and as He entered into a certain town, there met Him ten men that were lepers, who stood afar off, and lifted up their voice, saying: Jesus, Master, have mercy on us. Whom when He saw, He said: Go, show yourselves to the priests. And it came to pass, that, as they went, they were made clean. And one of them, when he saw that he was made clean, went back, with a loud voice glorifying God: and he fell on his face before His feet, giving thanks: and this was a Samaritan. And Jesus answering said: Were not ten made clean? And where are the nine? There is no one found to return and give glory to God, but this stranger. And He said to him: Arise, go thy way; for thy faith hath made thee whole.